May 18: Napoleon Crowned Emperor! MAY 18, 1804 — NAPOLEON BECOMES EMPEROR OF FRANCE! 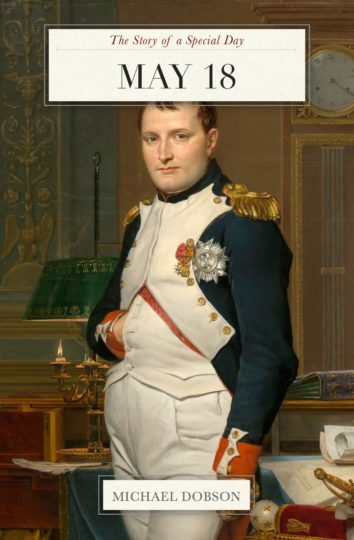 On May 18, 1804, the Senate of the First French Republic voted to make Napoleon Bonaparte their Emperor!. In other news, Rhode Island became the first English colony in North America to outlaw slavery, Lincoln won the Republican nomination for President, and Jackie Cochran became the first woman to break the sound barrier. Saint Pope John Paul II was born on May 18, 1920. Other May 18 birthdays include “It’s a Wonderful Life” director Frank Capra, Civil War photographer Mathew Brady, last tsar of Russia Nicholas II, Persian poet Omar Khayyam, singer Perry Como, actress and writer Tina Fey, philosopher-mathematician Bertrand Russell, and slugger Reggie Jackson. African-American educator Mary McLeon Bethune, bourbon inventor Elijah Craig, and composer Gustav Mahler died. May 18 is Battle of Las Piedras Day in Uruguay, Independence Day in Somaliland, and National Cheese Souffle Day in the US! (If it falls on the third Friday, it’s National Pizza Party Day, and if it’s the third Saturday, it’s World Whisky Day.) In astrology, May 18 is in the sign of Taurus. May’s birthstone is the emerald, and its birth flowers are lily of the valley and hawthorn. The Story of a Special Day is a special occasion gift they’ll never throw away — a whole book for the price of a premium card! The story of a special day.tells you what happened in history, who was born, and who died. What happened on *your* special day? From celebrations around the world to significant moments in history, birthdays, zodiac signs, and all-month events, this book makes a perfect birthday present or anniversary gift — one that will be kept and remembered long after an ordinary card has been forgotten! Each volume of The Story of a Special Day is packed with rare historical photos and fascinating facts. With 78 pages packed with over 47 historic photographs and illustrations, this book is a feast for the eyes as well as for the brain. A perfect birthday present or anniversary gift, “The Story of a Special Day” will make anyone feel special on his or her very special occasion.